Following Morning overcast however the forecast was No rain. Down for breakfast quiet pleasant the man of the house was a football referee and I think he would have preferred to have chatted about football instead of serving our breakfast's and then rushing off to work. A nice large house but their obviously having to diversify to pay the mortgage. 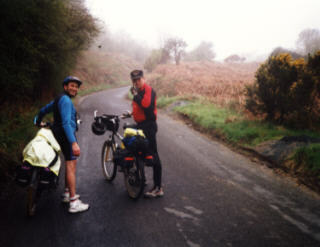 It was handy because we left, despite an uphill start, we were on the right side of arm to get towards the route. Overcast but No wind as we cycled slowly out of Yarm passed Kirklevington Open prison towards Route 65. 4 miles across country we came to the first junction where we would plug in to the White Rose Route 65-Guess what No sign..
We cycled towards Hutton Rudby and at last at the Junction with the Stokesley road we saw the first sign. We photographed the event. The next sign we saw was confusing and we came off route early down through Potto Village which was no hardship. We picked up the route down over the A 172 with impressive signing and into Swainby village where Graeme used the posh Swainby public loos, which had won awards ?? Swainby was our first stamping stop and into the shop for the stamp, the guy warned us about Swainby bank. As if we needed warning it was overcast and misty as we started to climb steadily. Unfortunately it was the first push. up through the mist. And on to the moor tops. Over sheepwash. We stopped by the Moors cross and enjoyed the stillness of the day and the reservoir until some little Herbert's came passed on a supposed controlled walk from school. You just blank little no marks like that, and we did. Graeme wanted to go into Osmotherley to see if he could find a North York's Moors Sign. So despite being off route we cycled into Osmotherley had a mooch around a pint at the Queen Catherine pub and bought Post cards. Then the fun started we cycled out of Osmotherely It was a steady climb for about a mile and a half. What made it worse was we didn't have to do it. It was made worse when we passed the moor road which was flat. 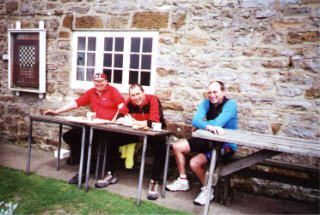 We arrived at the Chequers and we stopped for Tea and Teacake, which Graeme paid for. he obviously felt guilty. We spent a half hour outside as the sun came out. 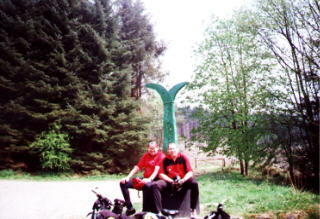 It was then on to the Silton forests and to me it turned out to be the most picturesque part of the ride. We turned off the road a Black Hambleton and the signs were a little confusing but eventually we found the special gate for the national Cycle network...Which obviously was not designed for MULTI DAY MEN as the panniers would not go through. Down through the Silton Forest with the sun shining. Out the other side at nether Silton. We stopped a few minutes and I showed Graeme and Colin an extremely rustic cricket field. 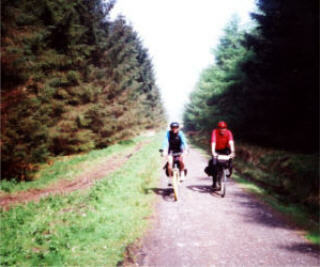 We cycle down towards Kenwick and Cowesby the sun shining and beautiful scenery. Asked for directions by a passing van driver. Had to kept cycling up one hill into Kenwick because of walkers and didn't wish to lose face. Outside Kepwick we met the road blocked by a JCB Digger the council workmen. Who had put on no diversions and he was not suited when he had to move his JCB. As we cycled through Kirby Knowie we had to decide the route and since it was only 2 pm we opted for along the side of the hills. Just outside Felixkirk we clocked 100 miles from Swalwell. WE thought we'd have a celebration drink, but as we arrived at the Pub in Felixkirk the door was closed in our faces literally. So we ventured on down to Sutton under Whitestone cliff and the start of My route ranger responsibilities. I stopped at the village entrance and attempted to charge a toll. 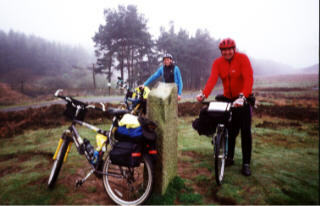 We then cycled into Sutton post office for our 2nd stamp and Graeme's comments in the guest book. We cycled on to Kilbum and the White Horse and the famous Mouseman furniture the Village was ok and the pint in the Pub but just because we were in cycling gear we got looked down our noses . As we cycled out of Kilbum Colin saw a wrecked wooden shed. he quipped they may be OK at Making fancy furniture but they are no good at making sheds. 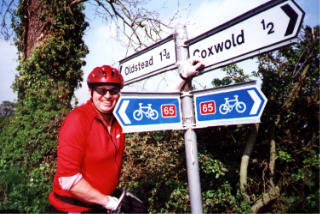 As we cycled each Route 65 on this stretch was receiving close inspection and when the sign at Oldstead comer was not pointing in the right direction, some temporary repair with a branch had to be made. Coxwold stopped at Newburgh priory to feed the ducks and then climbed up onto the Tops. Noticed a Route 65 sign which enormous doing nothing but protecting a little used bridle way.?? It was then a pleasant ride on undulating country to Easingwold and then round the back of the town. Sustrans special. But we binned out and onto the Helper by road for a 7 mile flat ride into Helper by and the farmers Arms. We arrived just after 6 and Graeme and myself had a couple of pints before we went to the very nice rooms.. Shower and shave and down for an excellent meal. Colin and me shared Spare ribs and it was still a feast? Graeme and myself then went on a mini pub crawl of Helper by. Colin had an early night which was probably the best idea. As although it was a good night I was a little worse for that night and in the Morning.